I was space trucking as I often do. For the most part, I was moving things for other people more so than for myself. The store only had a handful of things to restock. However, a contract to move a Dominix and Apocalipse Navy Issue got me undocked and enroute through space. I could have autopiloted. I was carrying 700 million ISK in cargo. That is a comfortable level for the freighter but I decided against it. Instead, I manually flew as I did other tasks. That was what led me to the Aufey gate. Aufey is a 0.5 system and one of a run of 0.5 systems I have to pass through from the Forge to Molden Heath. It is one of the reasons I rarely autopilot unless empty. I also don't look at the system stats often. After all, I don't consider myself a gank target. I also cannot avoid this group of systems and get to where I am going with any reasonable speed. If I had looked, I would have noticed that Aufey was highly active that night. I wasn't paying attention for the most part. I was jumping and warping while Sugar prepared for a fleet. When I jumped into Aufey my mouse went to jump to the next gate. At that moment I saw a flashy red catalyst warp in. Only, it didn't warp to the gate and jump. Its position off of me was just odd enough that the back of my mind started to whirl and I knew a gank was incoming. Was it for me? I had 700 mil in the hold. We've recently been doing math on Brutix's needed to pop a freighter. I decided to be cautious. If they were coming for me, faction police would start to spwan before my gatecloak died. But, they'd not warp in without knowing where I was. It wasn't for me. I spun my camera to get a good idea of where the Catalyst was. A quick swirl twisted Eve into three dimensional space and I saw that the Catalyst was beside an Orca. Oh my, oh my, oh my. A gank was indeed about to go down. I held my gatecloak and started to snap pictures. Sadly, my graphics were not at optimal. I normally keep them turned down on utility accounts I am not watching due to my other habit of having multiple accounts up and often another game playing at the same time. And then I watched. 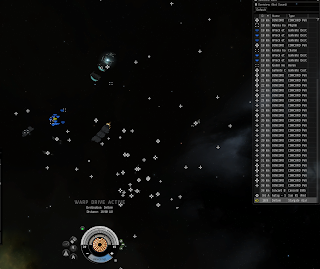 It was about five seconds until the rest of the Catalyst fleet landed. Just long enough that I wondered if I was wrong. My first question was, "a Catalyst fleet for an Orca?" I, fortunately, remembered that my boys use Catalysts to kill mining Orcas all of the time. My own tanked Orca was a different story. I wondered what would happen. Would they kill it? I wondered. Oh yes. It was dead. Nice. I was told to go steal the wreck. I snorted. They were 18k off of me and anyone that has moved a freighter knows that it would take a good 5-10 minutes to cross that distance. After that, I'd be suspect flagged and killable. Plus, they had their own freighter landing on field. 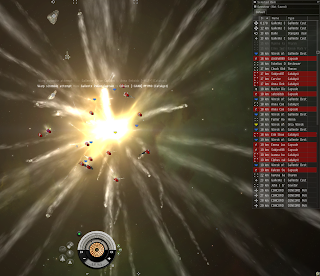 Safely off into warp, I waited for Eve-Kill to update and tell me what had happened. How much was the Orca worth? How was it fit? Were they tanked? 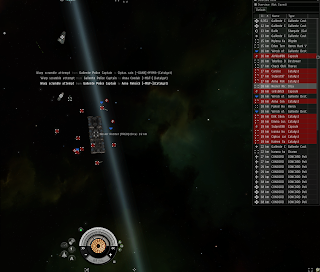 Upon thinking about it I suspect they had jumped into the system and gone AFK. They were about 15k off the gate which is jump in range and stationary the entire time. Afk and almost a billion ISK that might drop. The ships were all in the ship maintenance bay where they will not drop. I truly wish CCP would alter drop mechanics some and allow us to get ship maintenance bay hulls dropped waiting to be boarded. In high sec the gank fleet would need an entire second set of clean pods to jump into the dropped hulls and Orcas to scoop the hulls into. Off I went, leaving the shattered remains of another space trucker behind. It is a violent life out here in space. But you can survive. It's like they say when running from zombies and bears. You don't have to be the fastest runner, just faster then the guy beside you. And if he is faster still, hamstring him.